UPDATE 23/3/12: I have discovered that 110 stations have changed numbering between CRUTEM3 and CRUTEM4 ! Therefore the map below has been revised to show just the new and discarded stations excluding those renumbered. The list of renumbered stations can be found here. The new data from the Hadley Centre and UEA CRU (HadCrut4) has been released. 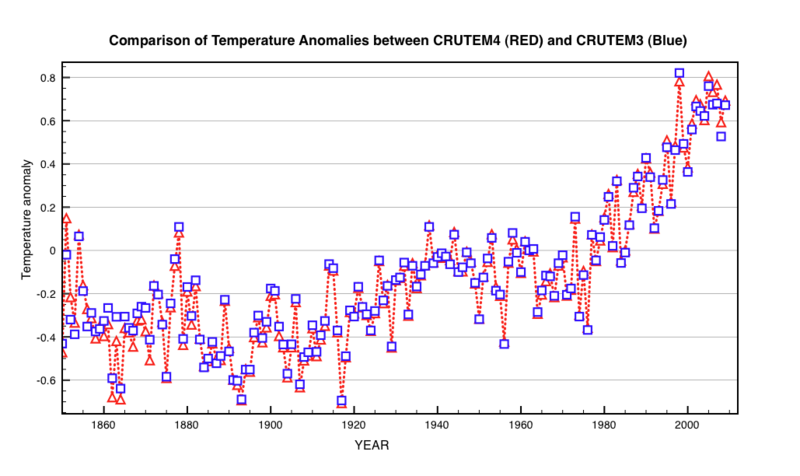 The temperature anomalies calculated just from the station data is called CRUTEM4. I have downloaded all the new station data and compared the results with the previous iteration CRUTEM3. What has changed? The most obvious difference is that many new stations have been added , while many others have been dropped. There are now 5549 stations in the set compared to 5097 in CRUTEM3. 738 628 new stations have been added while 286176 stations have been discarded. We can see exactly which stations have been added and lost in the map below. The red points are the new stations added in CRUTEM4, while the blue points are those discarded from CRUTEM3. Drag a rectangle in the map to zoom in. Click on a station to view data. Clearly the new points are all in the northern Arctic regions especially over Russia. Some of the dropped stations have few updates since 2000, but whether that means they no longer exist is unclear. Many stations have been dropped from Northern America. What is the effect of this on temperature anomalies ? I calculated the anomalies for both data sets using the Hadley provided scripts and compare both results below. There is no real statistical difference beween the two results. Small differences that are apparent are concentrated at end of the 19th century (slightly lower) and more contentiously (slightly higher) during the last 10 years. HADCRUT3 has shown no warming since 1998 and this has become something of an embarrassment to the AGW narative. A zoom in to the last 10 years identifies the subtle new change. 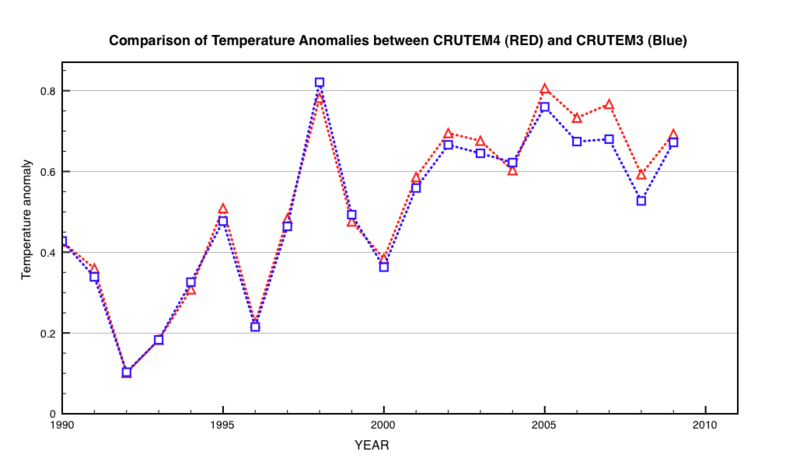 CRUTEM4 now places 2010 a tiny bit warmer than 1998, but there is no statistical significance to this despite the propaganda value. Note also that this result covers just the land station data. HADCRUT4 also includes sea surface temperature data form the Hadley Centre which have also been updated. This may then explain other differences as discussed for example here. For details of how the sea surface data has been updated – see the Met Office Web site. I can understand why it is thought a good idea to include more station data from Russia, but it is difficult to understand why station data from the USA (which ought to be good quality data – if there is such a thing) has been dropped. As I understand matters, much of the USA has undergone cooling since the 1930s. It would be interesting to know whether the discarded USA station data shows a cooling trend, or at any rate a warming trend of less than about 0.7 deg C per century. Could you elaborate a little? I have seen the changes described as “not statistically significant” more than once now, but don’t know what ‘statistic’ or calculations, if any, that are/is being referred to. When you get caught by a speed camera the measured speed has to be 10% above the speed limit to be “statistically significant” in order to send you a fine. This is because the error on the radar is 10%. So if you drive in the fast lane of a UK motorway at 77 miles per hour then you will not be done for speeding. The same is true for global temperatures. The statistical error on one yearly global temperature measurement is about 0.05 degrees C. So when someone tells you that 2010 was 0.01 degrees hotter than 1998 – they are talking nonsense. It actually means the temperatures are the same within measurement errors. Thanks Clive, so the changes made are less than the error limits of the measuring instruments/thermometers, if I understand you correctly? Clive says “when someone tells you that 2010 was 0.01 degrees hotter than 1998 – they are talking nonsense.” And he’s right. Yet the Met Office are doing exactly that in their March 19 press release on HADCRUT4 (last link in Clive’s post). They have a table of yearly rankings for HADCRUT3 and HADCRUT4 in which 2010 beats 1998 by 0.01, but the uncertainty in the figure is 0.1 – ten times the difference! Why is the Met Office trying to mislead the public? I just sent them a complaining letter (posted at Bishop Hill Discussion thread) . See also David Whitehouse’s post at GWPF. Are you sure this is all correct? You said at BH that Alert, Canada had been dropped, but it is there in the CRUTEM4 data set. Similarly your map shows Ascension Is. dropped, but it is in the data. The problem might be that the station id numbers have changed. Alert was 710820 but is now 713550. Ascension was 619000 but is now 619020. I just don’t believe it ! You mean they changed the station number IDs! In all my time as a scientist I have had one golden rule ” one must never changes the unique ID of any measurement”. For me that is sacrilege. I guess I will now have to go back and build a mapping index from the “OLD ID” to “NEW ID”. Are these guys physicists ? A useful thing to do first (I was planning to do this myself, and I have asked CRU if they already have it) would be to go through all the crutem4/station_files folders and produce a file with a list of stations and their ID numbers and lat and long. There already is a such a list crustnsused.txt of stations used in CRUTEM3 that you can find on the web. Then the two lists could be compared and we could see which stations have changed numbers and which have been dropped. I’ll do something along these lines by tomorrow and post it up here. I have already written a PERL script to identify the “numbers” from all the directories which is what I used to generate the DIY Map. CRU confirmed to me that some numbers have changed and that in most cases it is the national met offices that changed the numbers, not CRU. CRU generated the files – not the national MET offices. How come the numbering didn’t change for HADCRUT3 then ? They are the same stations. Going from HADCRUT3 to HADCRUT4 110 stations have changed their station number ! The full list of stations plus their OLD number(H3) and NEW number (H4) can be found here. SoI will need to redo the map in this post since now only 176 stations and not 286 stations been dropped. I will update this probably tomorrow !